Don't forget: Our first free guided walk of 2013 is Sunday, and it an awesome triple-header. First we'll look for duckage at DeKorte Park (and keep fingers crossed that the Shorebird Pool has some open water. Next, we'll check out Disposal Road for raptors (above) — and hope we get a Bald Eagle or Rough-legged Hawk. 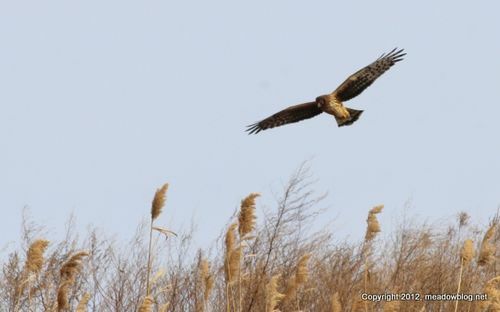 Finally, we'll walk into Harrier Meadow to see what's hanging around. Waterproof boots and warm clothes are advised. You'll need to sign a liability release, good for all of 2013. 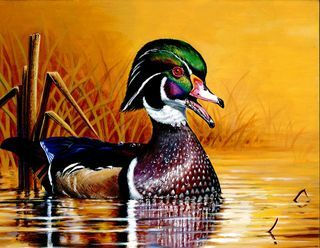 The Record had a story yesterday on the Junior Duck Stamp Art now on display at the Flyway Galery. "Departing Through the Sunset" by Tenafly student Jae Yong Sung will advance into the national competition after winning Best in Show at the New Jersey Jr. Duck Stamp Art Competition. The link to the entire story is here.